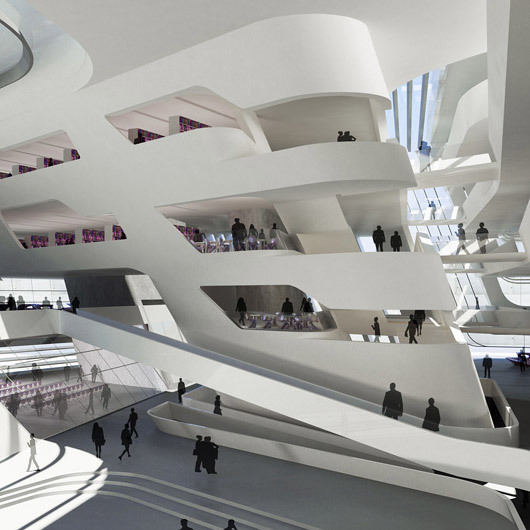 Zaha Hadid Architects have been selected as the architects of the Library and Learning Center (LLC) at the University of Economics & Business, Vienna. The new Library and Learning Center will be the centerpiece of the Universityâ€™s new campus and provide a significant upgrade to the Universityâ€™s services. In addition to the new library, the LLC will also provide a language laboratory, tutorial rooms, administration offices, student center, book shop, cafeteria, club rooms and event space. 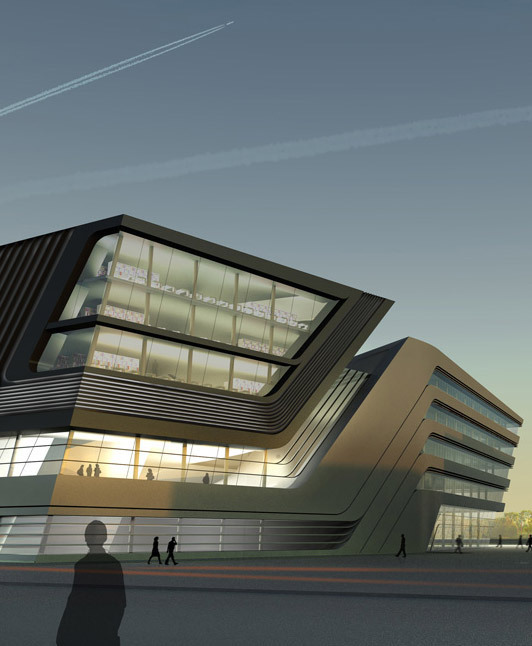 The new Library and Learning Center rises as a polygonal block from the center of the new university campus. 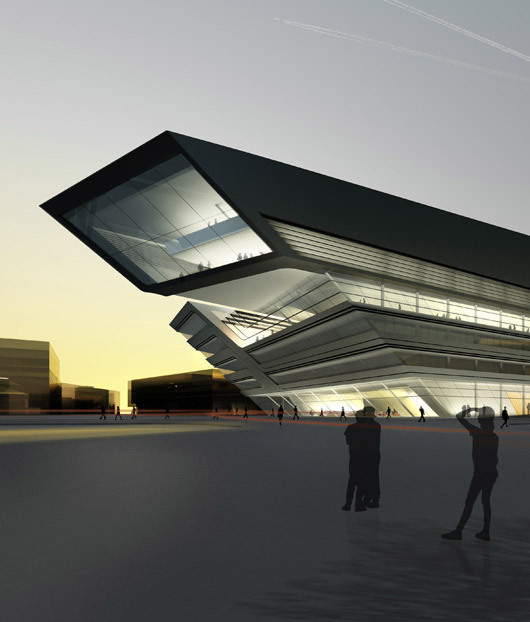 The LLCâ€™s design takes the form of a cube with both inclined and straight edges. The straight lines of the buildingâ€™s exterior separate as they move inward, becoming curvilinear and fluid, generating a free-formed interior canyon that serves as the central public plaza. All the other facilities of the LLC are housed within a single volume that also divides, becoming two separate ribbons that wind around each other to enclose this glazed gathering space. â€œI am delighted to be working in Vienna as I have a close affiliation with the city. 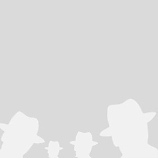 As a center of research, the Library and Learning Center is forum for the exchange of ideas. 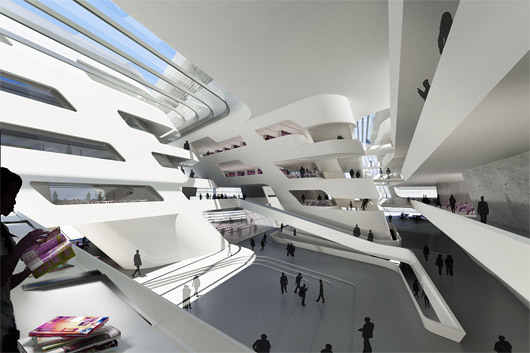 It is very exciting for us to be part of the Universityâ€™s expansion.â€ states Zaha Hadid. PROGRAM: The LLC comprises a â€œLearning Centerâ€ with workplaces, lounges and cloakrooms, library, a language laboratory, training classrooms, administration ofï¬ces, study services and central supporting services, copy shop, book shop, data center, cafeteria, event area, club room and auditorium.